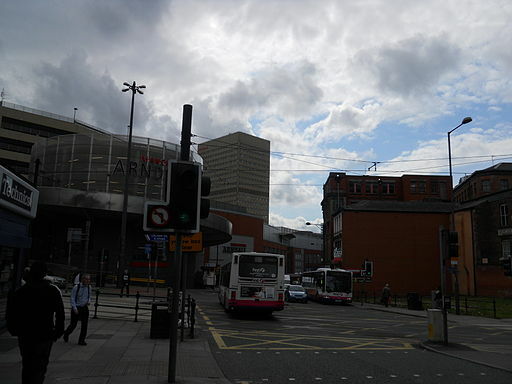 Before going to Manchester, everyone was telling me how horrible the city is, how there is nothing to do and asking me why I am going there. To tell the truth, I did have my doubts, but these were dispelled when I got there. I thought the city was going to be run down and all boarded up, but to my surprise, most parts of the city look vibrant and thriving. Yes, there are some parts which are run down, however it also seems that tons of money has been invested lately and the city is being renovated. What is interesting is that the old industrial history of the city is being preserved and the old industrial architecture is being incorporated into the new architecture. Many of the old buildings have been turned into lofts, stores or just cool places and some of them have been combined with new additions to bring a new funky look for the city. I got there late in the evening, but thanks to the fact that the UK is one hour behind the continent, I could rewind my watch and end up back in time! 🙂 I took the trip with a friend and we landed at the Manchester airport. Not us: we were there to stay for the weekend and nothing would phase us! 🙂 We got to the hostel, put down our bags and headed straight into the city to explore and find something to eat. We were staying in the Northern Quarter, which is supposed to be a hip area and you could see that there were a bunch of bars there. 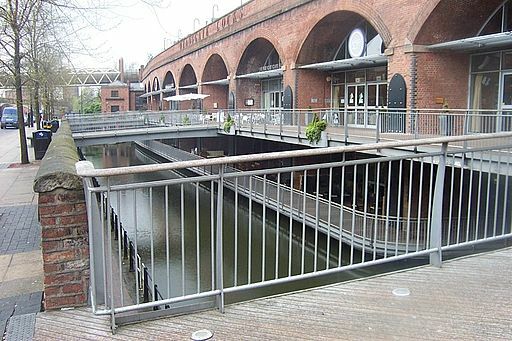 However as we had no idea which bars were good, I didn’t want to risk it and so decided to head for the Deansgate Locks, which is the premier party area in the city. We were starving, but kept heading south until we got to an area where there were no places to eat. There were a bunch of bars everywhere though. However I was so hungry that I did not want to enter any of them. We finally found a place that was serving food. It was actually pretty cool and it was part bar, part restaurant and part bowling alley: a very interesting concept. After the meal, which was a bit pricey, but good overall, we headed over to the Deansgate Locks. This is a bunch of bars located in the center of the city. They are located in the arches of an old, but still functioning rail bridge, and right next to a canal, hence the name “locks”. It’s a pretty cool way to make use of what is already there. They took the different arches and converted each of them into a different bar/club. There is even a comedy club under one of the arches! When we got there, there was a huge line in front of one club. I had read up on this area a bit before going to Manchester and somewhere I read that one of the clubs is popular with celebrities. I guess that was it. The first club we went to was located at the total end of the bridge under the last arch. It’s called Buddha. It has two floors, but was really crowded. There were a bunch of good looking girls in there, however it seemed to have mostly social circles. Then we decided to go to the bar next to that, I believe it is called BaaBar. Unfortunately, when we got there, it was a big sausage fest, so we quickly left. Then we went to a place called Revolution, which is located in the middle arches. It doesn’t seem so from the outside, but it is a pretty big place. You can also go downstairs, where there is a dance floor area, but also an outside patio right on the canal. The next day, we did some walking around Manchester. It’s not a super great city in terms of tourist attractions, however there are several interesting things. What I liked was the contrast between the old industrial architecture and the new things they are building. The old industrial buildings are being renovated and converted to things like lofts, restaurants or other things. Right next to them, new glass buildings are being built, however the two architectural styles play together quite nicely. During the evening we also went to Deansgate Locks, but it was a bit more chill. We started off at the Comedy Club. The arches not only contain normal dance clubs and bars, but there is also a comedy club, where you can come in if you fancy a laugh. It was a pretty interesting experience. Many of the jokes were very Manchester oriented (making fun of people from certain towns, areas…etc), so I didn’t always understand them, but otherwise it was a good experience. I liked my time in Manchester and would recommend the city to anyone who fancies a light, but fun weekend partying and strolling around.